Jaundice is not a disease but rather a sign that can occur in many different diseases. Jaundice is the yellowish staining of the skin and sclera (the whites of the eyes) that is caused by high levels in blood of the chemical bilirubin. The colour of the skin and sclera vary depending on the level of bilirubin. When the bilirubin level is mildly elevated, they are yellowish. When the bilirubin level is high, they tend to be brown. Bilirubin comes from red blood cells. When red blood cells get old, they are destroyed. Haemoglobin, the iron-containing chemical in red blood cells that carries oxygen, is released from the destroyed red blood cells after the iron it contains is removed. The chemical that remains in the blood after the iron is removed becomes bilirubin. The liver has many functions. One of the liver's functions is to produce and secrete bile into the intestines to help digest dietary fat. Another is to remove toxic chemicals or waste products from the blood, and bilirubin is a waste product. The liver removes bilirubin from the blood. After the bilirubin has entered the liver cells, the cells conjugate (attaching other chemicals, primarily glucuronic acid) to the bilirubin, and then secrete the bilirubin/glucuronic acid complex into bile. The complex that is secreted in bile is called conjugated bilirubin. The conjugated bilirubin is eliminated in the feces. (Bilirubin is what gives feces its brown colour.) Conjugated bilirubin is distinguished from the bilirubin that is released from the red blood cells and not yet removed from the blood which is termed unconjugated bilirubin. 3. Blockage of the bile ducts that decreases the flow of bile and bilirubin from the liver into the intestines. (For example, the bile ducts can be blocked by cancers, gallstones, or inflammation of the bile ducts). The decreased conjugation, secretion, or flow of bile that can result in jaundice is referred to as cholestasis: however, cholestasis does not always result in jaundice. Jaundice or cholestasis, by themselves, causes few problems (except in the newborn, and jaundice in the newborn is different than most other types of jaundice, as discussed later.) Jaundice can turn the skin and sclera yellow. In addition, stool can become light in colour, even clay-colored because of the absence of bilirubin that normally gives stool its brown colour. The urine may turn dark or brownish in colour. This occurs when the bilirubin that is building up in the blood begins to be excreted from the body in the urine. Just as in feces, the bilirubin turns the urine brown. Besides the cosmetic issues of looking yellow and having dark urine and light stools, the symptom that is associated most frequently associated with jaundice or cholestasis is itching, medically known as pruritus. The itching associated with jaundice and cholestasis can sometimes be so severe that it causes patients to scratch their skin "raw," have trouble sleeping, and, rarely, even to commit suicide. 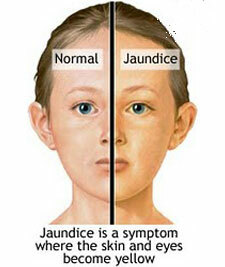 It is the disease causing the jaundice that causes most problems associated with jaundice. Specifically, if the jaundice is due to liver disease, the patient may have symptoms or signs of liver disease or cirrhosis. (Cirrhosis represents advanced liver disease.) The symptoms and signs of liver disease and cirrhosis include fatigue, swelling of the ankles, muscle wasting, ascites (fluid accumulation in the abdominal cavity), mental confusion or coma, and bleeding into the intestines. If the jaundice is caused by blockage of the bile ducts, no bile enters the intestine. Bile is necessary for digesting fat in the intestine and releasing vitamins from within it so that the vitamins can be absorbed into the body. Therefore, blockage of the flow of bile can lead to deficiencies of certain vitamins. For example, there may be a deficiency of vitamin K that prevents proteins that are needed for normal clotting of blood to be made by the liver, and, as a result, uncontrolled bleeding may occur. 3. Absorption of large amounts of haemoglobin when there has been much bleeding into tissues (e.g., from hematomas, collections of blood in the tissues). Any condition in which the liver becomes inflamed can reduce the ability of the liver to conjugate (attach glucuronic acid to) and secrete bilirubin. Common examples include acute viral hepatitis, alcoholic hepatitis, and Tylenol-induced liver toxicity. Chronic inflammation of the liver can lead to scarring and cirrhosis, and can ultimately result in jaundice. Common examples include chronic hepatitis B and C, alcoholic liver disease with cirrhosis, and autoimmune hepatitis. Infiltrative diseases of the liver refer to diseases in which the liver is filled with cells or substances that don't belong there. The most common example would be metastatic cancer to the liver, usually from cancers within the abdomen. Uncommon causes include a few diseases in which substances accumulate within the liver cells, for example, iron (hemochromatosis), alpha-one antitrypsin (alpha-one antitrypsin deficiency), and copper (Wilson's disease). Diseases causing inflammation of the bile ducts, for example, primary biliary cirrhosis or sclerosing cholangitis and some drugs, can stop the flow of bile and elimination of bilirubin and lead to jaundice. The most common causes of blockage of the bile ducts are gallstones and pancreatic cancer. Less common causes include cancers of the liver and bile ducts. Many drugs can cause jaundice and/or cholestasis. Some drugs can cause liver inflammation (hepatitis) similar to viral hepatitis. Other drugs can cause inflammation of the bile ducts, resulting in cholestasis and/or jaundice. Drugs also may interfere directly with the chemical processes within the cells of the liver and bile ducts that are responsible for the formation and secretion of bile to the intestine. As a result, the constituents of bile, including bilirubin, are retained in the body. The best example of a drug that causes this latter type of cholestasis and jaundice is oestrogen. The primary treatment for jaundice caused by drugs is discontinuation of the drug. Almost always the bilirubin levels will return to normal within a few weeks, though in a few cases it may take several months. There are several rare genetic disorders present from birth that give rise to jaundice. Crigler-Najjar syndrome is caused by a defect in the conjugation of bilirubin in the liver due to a reduction or absence of the enzyme responsible for conjugating the glucuronic acid to bilirubin. Dubin-Johnson and Rotor's syndromes are caused by abnormal secretion of bilirubin into bile. 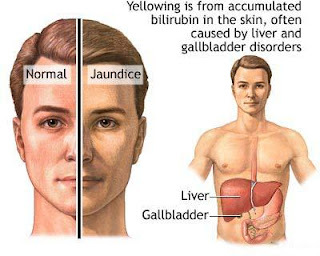 The only common genetic disorder that may cause jaundice is Gilbert's syndrome which affects approximately 7% of the population. Gilbert's syndrome is caused by a mild reduction in the activity of the enzyme responsible for conjugating the glucuronic acid to bilirubin. The increase in bilirubin in the blood usually is mild and infrequently reaches levels that cause jaundice. Gilbert's syndrome is a benign condition that does not cause health problems. There are rare instances in which the bile ducts do not develop normally and the flow of bile is interrupted. Jaundice frequently occurs. These diseases usually are present from birth though some of them may first be recognized in childhood or even adulthood. Cysts of the bile duct (choledochal cysts) are an example of such a developmental abnormality. Another example is Caroli's disease. Most of the diseases discussed previously can affect women during pregnancy, but there are some additional causes of jaundice that are unique to pregnancy. Cholestasis of pregnancy. Cholestasis of pregnancy is an uncommon condition that occurs in pregnant women during the third trimester. The cholestasis is often accompanied by itching but infrequently causes jaundice. The itching can be severe. Pregnant women with cholestasis usually do well although they may be at greater risk for developing gallstones. More importantly, there appears to be an increased risk to the foetus for developmental abnormalities. Cholestasis of pregnancy is more common in certain groups, particularly in Scandinavia and Chile, and tends to occur with each additional pregnancy. There also is an association between cholestasis of pregnancy and cholestasis caused by oral estrogens, and it has been hypothesized that it is the increased estrogens during pregnancy that are responsible for the cholestasis of pregnancy. Pre-eclampsia. Pre-eclampsia, previously called toxaemia of pregnancy is a disease that occurs during the second half of pregnancy and involves several systems within the body, including the liver. It may result in high blood pressure, fluid retention, and damage to the kidneys as well as anaemia and reduced numbers of platelets due to destruction of red blood cells and platelets. It often causes problems for the foetus. Although the bilirubin level in the blood is elevated in pre-eclampsia, it usually is mildly elevated, and jaundice is uncommon. Treatment of pre-eclampsia usually involves delivery of the foetus as soon as possible if the foetus is mature. Acute fatty liver of pregnancy. Acute fatty liver of pregnancy (AFLP) is a very serious complication of pregnancy of unclear cause that often is associated with pre-eclampsia. It occurs late in pregnancy and results in failure of the liver. It can almost always be reversed by immediate delivery of the foetus. There is an increased risk of infant death. Jaundice is common, but not always present in AFLP. Treatment usually involves delivery of the foetus as soon as possible.